Small, yellow to brown octopus with large, bright blue rings on the arms and mantle. The blue rings can be muted or pulse as warning sign of their toxicity. When sitting still the rings will be less visible. Unassessed by the IUCN Red list. An uncommon species of octopus, known only from the Indo-West Pacific. Indo-West Pacific: from Indonesia and the Philippines to Australia and the Solomon islands. 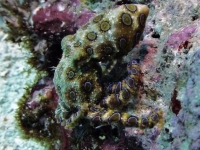 Out of all blue-ringed octopus species, this is the most widely spread. They can be found on coral reefs and rubble, usually in cover of crevices and overhangs, in a depth range of 0-20 meters. Males perform displays to attract females for mating. The female hatches the embryo’s and they spend some time in a planktonic phase before they settle to the bottom and grow further. Males and females die shortly after mating. They feed on small crabs and crustaceans. 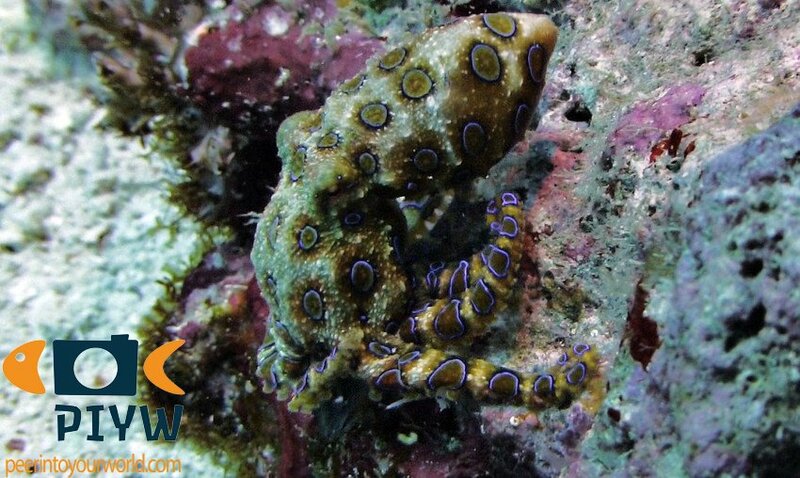 Blue-ringed octopus are very poisonous (lethal) and should never be provoked. However they usually have a very docile nature and when approached with care they will not flee. They carry enough tetrodotoxin to kill 26 humans within several minutes. Their bite is short and usually painless, but causes paralysis of the diaphragm and hence respiratory problems, resulting in death by suffocation. By flashing its blue iridescent rings and pulsating them, it warns off predators, telling them it is toxic.